Saying owners are abusing the law, a state senator wants to make it illegal to misrepresent a dog as a “service animal” in order to bring it into places where pets are not allowed. The proposal by John Kavanagh, a Fountain Hills Republican, would allow judges to impose fines of up to $250 on someone who fraudulently misrepresents an animal as a service animal or service animal in training to anyone who operates any business or recreation site open to the public, as well as buses, taxis and ambulances. An individual would have to produce proof that the animal had been trained for a specific chore covered by the Americans with Disabilities Act, Kavanagh said.The senator said nothing in his proposed legislation, SB 1040, would allow a business owner to refuse to let someone enter the premises solely because of the failure to provide such written proof. In fact, existing Arizona law prohibits requiring identification for the service animal. Instead, Kavanagh said, it would be up to a business owner to file a complaint and have the issue heard by a court. But Sarah Kader, attorney for the Arizona Center for Disability Law, said that presents problems of its own. Kader said she could foresee a business owner calling the police on someone. Then the officer would issue a citation, forcing the person with the disability to find his or her way to court to answer the charges. And if that person lacked transportation, she said, a warrant for arrest would be issued. She also questioned whether there really is a problem. Such service includes assisting people with vision and hearing loss or balance stability, pulling a wheelchair or sensing when someone is about to have a seizure. The law also covers helping those with psychiatric and neurological disabilities “by preventing or interrupting impulsive or destructive behaviors,” but does not include animals purely for emotional support, comfort or companionship. Generally speaking, service animals are dogs. But Arizona law also allows for the use of miniature horses. Kavanagh said he has no problem when there is a legitimate need. But he’s convinced that there are a lot more animals being brought into businesses than the law allows.“People complain all the time, ‘there was a dog in the coffee shop,’ ‘a woman took a dog on a plane,’” he said. Unmut“I see it everywhere,” Kavanagh continued. “Everyone sees it. And it’s getting out of control.The tricky part for business owners is that they legally cannot ask someone with an animal about his or her disability. Instead, they can ask only if the animal is a service animal and what tasks the animal has been trained to perform. They cannot demand to see any sort of special ID card. Kavanagh said people abuse the system. And he sees nothing wrong with requiring people to prove to a judge that their animals have been properly trained for a specific disability covered by the ADA. Kader said one big flaw in Kavanagh’s proposal is that nothing in the law requires that a service animal be formally trained. She said that would subject people to who have trained their own animals for legitimate ADA-covered needs to fines. And what if people are using the law, and a claim of a disability, to bring Fluffy or Fido into the grocery or restaurant solely to make sure they’re not left in a hot car? Kader said she remains convinced the problem, to the extent one exists, is minor. “I think Kavanagh and others who are putting these (laws) forward are making a big deal like there’s thousands of people out there with these fraudulent service animals,” she said. Kader said business owners always have the option to approach someone and ask the two permitted questions to weed out who is entitled to bring an animal in. The bigger problem, she said, is what happens next if someone can’t produce proof of training. But Kavanagh said those with disabilities should like his proposal. 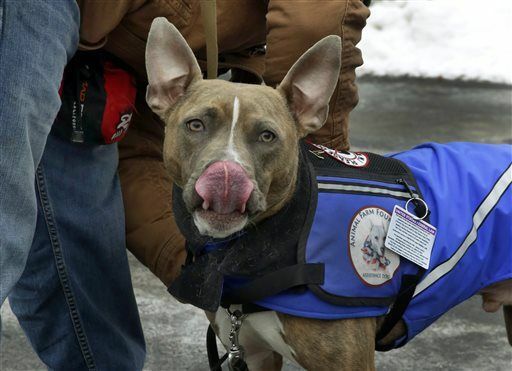 “We’re going to whittle away at an abuse and, hopefully, take the heat off legitimate service animals that are trained and are helping people,” he said. This isn’t the first time lawmakers have grappled with the issue. In 2015, Rep. Bob Thorpe, R-Flagstaff, proposed to have state health officials issue permits, complete with photos of owners and the dog or horse, to service animals. He insisted at the time that would actually help the disabled by ensuring they get fewer questions from business owners. That proved so controversial that it was killed unanimously in committee, with Thorpe voting against his own proposal.